Welcome to our 2016 Winter Issue of the South Shore Magazine. Well, winter is REALLY here now! After being kind of fully teased for December and January with record warmth and little snow, Mother Nature and Old Man Winter teamed up to say, “not so fast!” As I write this edition’s publisher’s letter, we are preparing for record cold and wind chills over the upcoming weekend. The good news is that the calendar says that there are only a few more weeks left until spring. Let’s wait and see. More good news is that you are reading the latest issue of South Shore Magazine, and you will be learning more about the businesses that make up the fabric of our region. Locally owned and operated is something that you hear less frequently in general, but I am pleased to say that locally owned and operated is far more common here on the South Shore than in other areas of our state and region. Let’s keep it that way by supporting locally owned and operated businesses. 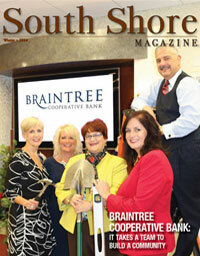 Our front cover and feature story is one such business: Braintree Cooperative Bank. With Mr. Paul Pecci at the helm, great people at the bank and great local banking strategies have helped this institution flourish here on that South Shore for decades. In our last issue, we focused on a local business, Hingham Furniture and Design (a sister business to Framing Concepts also in Hingham). At the time of the autumn edition, Diana Cousineau Aveni was in the midst of renovation of an antique building at 44 North Street and the transformation is SPECTACULAR. We have a three-page pictorial article of the Hingham Furniture and Design and their magnificent offerings. They will also be featuring a very unique and beautiful line of outdoor furnishings that will have you thinking this can’t actually be outdoor furniture! I have seen some of the line on the vendor’s website, but you can get a sneak preview at the Boston Flower and Garden show at The Seaport World Trade Center from March 16 -20, where Diana will be displaying some products. Enjoy! We also have a couple of articles geared specifically to our women readers in our Health and Wellness section from Dr. Christine Hamori in Duxbury and Glow Beauty Boutique in Braintree. Also, we continue with our series of articles on Dr. Steven Matarazzo and his amazing talents in dental restoration. Finally, in Health and Wellness, we can’t forget about our furry and feathered and scaled friends. Learn more about exotic pet care at VCA in Weymouth! Next, we all know that Craft Beer is a big business. Learn more about the Big Brewers’ take over and acquisitions in my article for our long time client, Marsh’s Wine and Spirits, as well as more about craft beer from Cicerone, Jean Marc Aubuchon. What goes great with craft beer (in my mind a lot!)? How about LIVE music? Check out the latest from local musician, Jay Psaros, in his continuing coverage of the South Shore music scene in, THE BEAT Volume 7. If you love live music like I do, but don’t get out to venues as much as you would like, then tune into South Shore Live HOUR 9 LOUNGE, brought to you by THE JETTY in Brant Rock, Marshfield. You will hear the best in local and regional music live in our studio from 9-10 pm on Monday nights. We have the most fun on the FM radio dial! In closing, thank you for your positive feedback to us and to our clients on how much you enjoy South Shore Magazine. We also have some exciting news about our latest product, a comprehensive food and beverage guide for the South Shore, debuting later this spring. Check out the inside cover of this issue for details. 2016 Winter Issue ~ READ NOW! ‹ Welcome to Our 2015 Summer Issue of the South Shore Magazine. › Welcome to our 2016 Late Spring Issue of the South Shore Magazine.